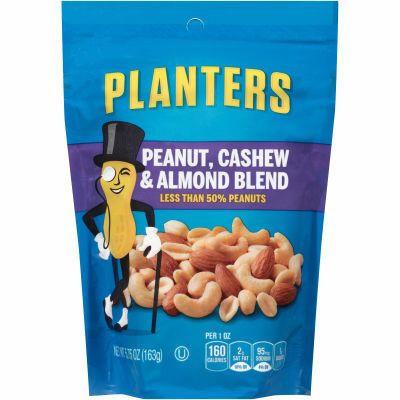 Planters Peanuts, Cashews & Almonds Mix - Perfect for those who enjoy snacking on a variety of nuts, Planters combines carefully selected peanuts, cashews and almonds, seasoned to perfection with pure sea salt to bring you the best tasting snack combination you could ask for. - The Perfect Mix of Crunch to Munch - Planters uses only its premium quality nuts to prepare this perfect mix which is packed with flavor and texture. A handful of this nut mix is a delicious choice for anyone craving a wholesome snack or an easy way to add some protein to a favorite dish. Serving size 1 oz (28g, about 40 pieces).